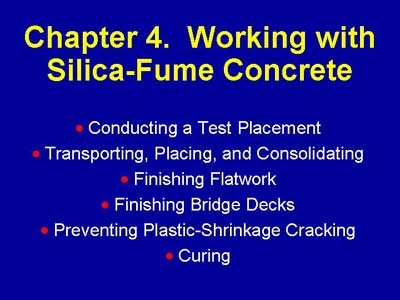 This chapter of the presentation describes the practical aspects of using silica fume in concrete. The entire process, from conducting a test placement through curing at the project site, is shown. Recommendations are given for all aspects of concrete placing, consolidation, finishing, protecting, and curing.